They say that the proof of the pudding is always in the eating. Here is how a straightforward backing system made up of a portfolio of nine leagues from our Summer League HDAFU tables made over £10,000 in 178 match days from £100 level stakes during 2016. Full details of the 2016 Summer League portfolio are included in a dedicated Excel workbook, which you can download here for free. This workbook details every bet placed in all nine leagues, together with a chronological summary, the winning and losing streaks, and the parameters of each system employed. It’s a must-have simply as a monitoring sheet template, and you will need it to understand much of what we talk about below. Just click on the button above and then on “Continue Checkout” in the pop-up box. Enter your name and e-mail address and our store will then deliver the file to you via e-mail, free of charge. The size of the Excel file is 278KB. (Warning: Please do not apply these systems to future seasons – the parameters will certainly have changed, with each league requiring a complete re-analysis). Note: When downloading this spreadsheet you will also receive a coupon code offering a discount of £5.00 GBP, redeemable against the purchase of any individual HDAFU Table. This allows you the opportunity to experiment and explore your first HDAFU Table without paying the full price for it and before you commit to buying more. Test drive and formulate strategies for any current season ‘on the cheap’! Here you will see the 15 separate systems derived from the HDAFU tables that were pooled together as a single campaign; a well-balanced mixture of backing home wins and favourites (six systems: low risk/low return) and away wins and underdogs (nine systems: higher risk/higher return). At the time of analysis, although there were viable systems for the draw apparent, other systems took preference. (However, several draw systems were employed in the subsequent Winter League portfolio). You will also see that in certain leagues, we different systems were run in the first and second halves of their seasons. In other leagues, the system chosen was a better fit for the whole of the season (U.S.A., Finland and Japan). Analysing the HDAFU tables is now a much faster exercise than ever before despite the fact that each league now comes with three separate workbooks: one to demonstrate the five full seasons approach; one limited to games in the first half of each season; one limited to games in the second half of each season. As frequently happens, there is more than one opportunity to analyse in each of the three workbooks, but only the most promising system per league is considered for inclusion, or two if the league is split into half seasons. Read more about this approach here. Running more than one system per league in the same market (in this case, the 1×2 market) causes confusion with conflicting betting decisions. It also means relying on something that is not the most promising in that league to help support the portfolio as a whole. With portfolio betting it is essential to field the strongest team from the start without involving any also-rans. To mix the best performing systems with lesser ones would be like mixing apples with pears. The sweet tasting apple pie we hoped to bake would be contaminated. Always better to compare and match apples with apples. On the whole, the time taken to analyse and then decide upon which system to support was no more than a couple of hours per league, sometimes a little more, sometimes less. For the nine leagues represented, less than 20 hours was spent coming up with the 15 systems. In columns F-P, you will see a complete breakdown of the figures the 15 systems forecasted for the 2016 season in each league. You will also see a box entitled Possible Yield Range (Row 30). The Average Yield and Lowest Yield expected are highlighted: between 23.86% and 1.58%. This is the more realistic threshold the final result was expected to occupy. It represents a cherry-picking exercise because the 46.05% figure is a synthesis of each league’s single highest profit season from the five analysed. Which season is the ‘best’ is also unlikely to be the same one in different leagues. For example, it might be the 2015 season in Japan and 2016 in Sweden. Although there is a tiny possibility that all nine of our leagues simultaneously experience their best season in the last six in the bet types we are targeting, the statistical chance is negligible. The HDAFU tables are based on highest market odds at the close of the ante post market and it is extremely unlikely that you will obtain the highest odds available with every bet you place. The more realistic expectation is therefore always going to be less than the Highest Yield forecast. Systems were chosen which showed a historical profit in at least four of the five seasons analysed. Even with a system based on five seasons’ profit, there would still be chance of it failing in the sixth season. The league may experience a lower than average hit-rate in the new season. In fact, the coming season may be an anomalous one altogether. For example, it records the worst hit-rate for home wins in the last 10 seasons. Without the need for a complicated mathematical calculation it can be said right away that there is a basic one in 10 chance of this occurring, and 10% is 10%, not zero. The more leagues and systems used, the more times this chance is faced and 10-year record highs and lows have to be set sometime. Of course, if we narrow things down and say that the league records its worst set of home wins in the next season (the sixth: the one after our five seasons’ analysis), the chance of the new season being the worst of the last six is a basic one in six (16.67%). Likewise, for a bet type to record its best results for 10 seasons, the chance is again 10%, and 16.67% in the last six seasons. Of course, the reality of the overall performance is likely to be somewhere in the middle (a standard distribution bell curve). Not all systems will fail and not all will over-achieve but by picking the sweet spots in the historical results, the chances of overall success are enhanced. Bookmaker odds across the board may be slightly lower than usual in response to repeating trends in the match results. There are definitely some seasons where the odds setting for a particular bet type is markedly different from previous seasons. It’s not often, but it does happen. This may not influence whether a profit is made, but it will affect the size of it. The forecasts and the results achieved were very close. The average forecast suggested a scenario of 849 bets with a hit-rate of 44.99%. The total eventually recorded was 825 bets (without missing a single betting opportunity) at a hit-rate of 43.52%. But even with these fractional shortfalls, a yield of 12.17% (cell V28) equated to a profit of £10,038, with all four bet types in profit – The higher risk/higher return away wins were the star performers with a profit of £7,097 (cell Y25). A yield of more than 12% is an excellent return. Anything over 5-6% is good. There are no savings plans that we are aware of that deliver such a large return in such a short space of time. And if you need reminding, the money in betting is not in perennially backing home wins and favourites. Only four of the 15 systems achieved yields in excess of their average expectations (V column cells filled in green). Three of these (plus another two) achieved hit-rates in excess of the five season average (T column cells filled in green). Overall, it was not an exceptional performance (it didn’t need to be), but it was a carefully planned one. It flew the mission, hit the objective and came back in one piece. The system avoided the bookmakers’ radars with a relatively small stake of £100 per bet. (Limited by the size of our initial bankroll). Aftermath – Why did Some Systems Fail? Going back and trying to figure out why things went wrong is an integral part of any betting system. It helps allay fears that perhaps you did something wrong – if you did, hopefully you’ll find the error. It’s not about creating excuses for failure; it’s more about peace of mind and learning lessons for the future. Life is all about continuing to learn. Getting the calculations correct when formulating the systems is fundamental. If theories are based on misleading information to begin with, you are sunk before you start betting. It was a strange season in Brazil. The crowd plays a hugely important role in football matches. We’ve all heard of ‘partisan atmospheres’, especially during local derbies. Following the undoubted rise in popularity in the game caused by hosting the World Cup in 2014, average attendances rose to a six year high of 17,160 per match in 2015 and then instantly fell by almost 10% to 15,809 in 2016. Increasing crowd violence and rising admission prices were held to blame. It is difficult to say how much of an influence the crowd effect has on a season, but it was certainly an anomaly in 2016. On top of this, results were also skew-whiff. The 2016 season saw 53.30% home wins. During 2011-13, this figure was around 48%; 2014 = 51.84%; 2015 = 52.63%. The differences between these figures do not seem great, but in 2016 there were 202 home wins, almost 20 more than in any of the seasons 2011-13. Whilst the first half season system based on home wins brought a profit, the home win anomaly detrimentally affected the underdog system in the second half of the season. The away win percentage (mostly underdogs) only hit 21.9% in the second half of the season, a six season low. However, the fact remains that the second half season underdog system was only one win away from turning a profit. If any one of the 21 lost bets had come in, there would have been profits across the board in Brazil. Instead, it was just a case of bad luck. The majority of expected home wins were in the second half of the season, when the preference was for the other way around. The second half of the season was miserable. It was tempting to pull the plug on this system at one stage, especially when it became obvious that this system would fail. But, the point of all of these systems is to hold firm and play them through to the end. Compare what happened in Norway with the last round of games in Japan where all five bets won. This is another example of synergy – the Norway losses were recovered elsewhere in the grand scheme of things. Norway recorded its lowest home win rate for six seasons and by more than 2%. This equates to six wins short of the lowest total in any of the previous five seasons, which in a 240 game season, is a big deviation. In the first half of the season, the incidence of home wins was 50.51%, with only 26.26% away wins. In the second half, when home wins were targeted, the rate dropped to a miserly 41.13%, whilst away wins were 31.21%. Like Brazil’s two systems, Norway’s results were precisely the wrong way around again. Norway was certainly anomalous as it produced the lowest home win rate in 2016 of any season since 2004. That 10% chance mentioned earlier came in here. You’ll see from the HDAFU tables (if you buy them!) that the Norwegian mid-season break (like Sweden) is around a third of the way into each season. The fact is that the season halves are disproportionate. Most of our bets were in the larger second half programme. Perhaps in future it will be a better idea to use a whole season analysis (i.e. dispense with the split season approach) in all leagues where the season halves are disproportionate. This was a lesson in gut-feeling. This system was taken on board largely due to previous successes in this league. The 2015 S-League had turned-in a yield of 37% and profits of £4,659. It was almost in homage to this result that underdogs were chosen again in both halves of the 2016 season. The league format in Singapore has changed dramatically recently. 2015 saw only 9 teams take part in the league, which was repeated in 2016. There were 13 teams in 2013. The statistics used to formulate the systems here were therefore disparate. In splitting the league into halves for the first time, a mixture of apples and pears was unwittingly analysed. The tiny loss incurred across the board was therefore a matter of luck. Okay, it was only 26 bets in total during 2016, but a small negative result wasted time that could easily have been avoided. Greed probably got in the way of the decision-making process as did the feel-good factor of winning well in previous seasons. 2017 will probably see a return to the whole season approach in this league too. Hi, I’m just wondering if a portfolio made up of various systems selected properly as you explained may end up with an actual negative yield…did it ever happen to you? Thank you and congratulations for the great website! Hi Mark, although normally it shouldn’t you can never say never. Targetting the sweet point in the odds using the HDAFU Tables you are targetting low probabilities and I’m sure that you experienced in your life probably even more than once that, when you were throwing a dice (16.67% probability for a ‘1’, for example) that you had to wait for 20 (or even more) rounds until the first ‘1’ was thrown. It probably happened to you only once in your life but certainly not ‘never’. In that case, you may have experienced a ‘negative yield’ should you have included the ‘1’ in your portfolio of bets. I can’t teach you how to use Excel, but the cluster sizes are determined by Excel’s maximum number of 200 reference points for producing graphs. This is a limitation that has always been a barrier in Excel, thus we can only produce 200 “clusters” in any one table. To be honest, it doesn’t make much difference: 200 clusters is plenty, and you will see that some odds account for multiple numbers of clusters – e.g. draw odds of 3.40 might account for several clusters of their own, whilst odds of 1.06 to 1.10 might be contained in a single cluster. Even if you could change it in Excel, it wouldn’t make much difference – you are still able to fine tune the results by looking at the data tab to determine where the profitable ends of the inflection points graph start (see the User Guide). Be sure to read the comments in the Winter League summary, which also contain a mine of useful hints and tips. How do you pick the clusters that you want to use, is there a methodology behind it? I have purchased the Netherlands HDAFU tables but was wondering why they are set the way they are and the thinking behind it. I’m not sure what you are referring to precisely? Do you mean the Inflection Points graph itself, or choosing which systems to go with that are highlighted by the graph? I am referring to the cluster sizes. How do you set them or decide on them? How do you group them and work them out and could this be changed or would it matter? I can suggest to have a look at Sportmarket Pro. It’s a multiplatform broker like Vodds that includes exchanges like Betfair at 2.5% fixed commisison, Betdaq at 1.2% fixed commission and Matchbook at 1.8% fixed commission ON WINNING BETS only, instead of every bet (winning and losing) like betting on Matchbook website. They also have Pinnacle, SBOBET, and all the major asian bookies. I used them for almost a year now and they are very professional and fast in their withdrawals also. Definitely check it out! Well, one of our accounts is Smarkets, whose commission rate is 2%, so we do use exchanges ourselves. Of course, if you wish to use Betfair, then their 5% commission rate will certainly take a chunk of your profits away. What was your starting bank for this cycle with £100 per bet? When we began the 2016 Summer League campaign, we started off with £2,000 in various accounts. But the official bank size on paper was set arbitrarily at £1,500 to cope with the longest possible losing streak of any one system. Our analysis showed this was 15 losing bets in a row in the Japanese J-League away win strategy. I say ‘arbitrarily’ because we never expected to lose 15 bets in a row with all the systems overlapping and supporting one another. Firstly, we are not giving away systems – merely the tools for individuals to decide upon their own strategies. As mentioned in the articles, everyone has their own levels of acceptable risk and, therefore, each person’s portfolio of chosen systems and bets will be different from the next person’s. Add to this the facts that each punter will be playing with different levels of stakes and have access to different sets of bookmaker and/or betting exchange accounts. Also, one person may not be as disciplined as another regarding the placement of every betting opportunity. Therefore, I would say that it is highly unlikely that you will see any noticeable betting patterns affecting the market as a result of any systems being followed by Soccerwidow readers. let’s suppose for a match on the HDAFU analysis two teams have the same odds. How do you ensure the correct calculations when the system have to count favourites and underdogs? How can Excel manage to understand which one is the real favourite? Maybe you just shorten one of the two by a 0.01 to achieve this purpose? If you’re using Oddsportal to check the odds, and the highest odds are the same for both teams, use the Average Odds as a tie-break. Whichever team has the higher average odds, make them the underdog, and vice versa. I have never seen a match where the highest odds are the same as each other, and where the average odds are the same as each other. For the sake of the HDAFU tables, we do occasionally increase the underdog odds by one tick as you suggest, but this happens so rarely that it should not be a statistical concern at all. How do you split the seasons for the mid-season break? Some seasons have their holiday breaks before the official closing of the first round of games (for example, although this changed in this year, the Italian Serie A had their holiday break just before Christmas, until around a week in the beginning of January, but the first round of games was finishing only one week later. So how do you choose when to split the season in a case like this? Is it on the longer holiday break, making the two halfs slightly different in terms of length, or just the official end of the round? Yes, it’s the holiday break – sometimes the two halves of a season do differ in length, but only by a few games and this is not likely to have much statistical significance on the results. We split wherever the ‘clean break’ is in the middle of a season. Marathonbet and 1x2bet seem to be so similar in their odds setting that it is difficult to see that they are not connected in some way. There must be some common denominator connecting both bookmakers (apart from the fact they are both Russian). My advice regarding the fluctuations in prices between these two and the rest of the market is to trust the majority as your guide. If the indication of the majority is within your inflection points, but you can get a higher price with Marathonbet or 1x2bet, then place the bet at best price with either of these two. But be careful, we have experienced situations where, although the prices on their sites are indeed well above the crowd, stakes are sometimes limited. This is just a method of attracting ‘quick’ money to help them balance their books, which is essential practise for low margin bookmakers of this nature. I am preparing a paper on odds movements throughout the ante post market, which should be available later this year. It will be a vital addition to your knowledge. I encountered one problem with Marathonbet a few times and will probably have it in the future. 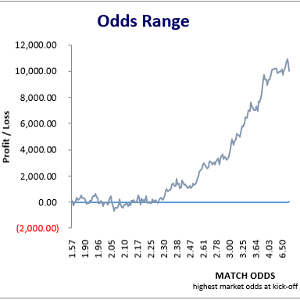 The problem is: I check odds in the Oddsportal on the outcomes having potential to bet on, 1 hour before kick off time odds are quite above my top (or below) inflection point I have to bet on across all bookmakers Oddsportal provides. But less than an hour before kick off time odds dropped significantly across all bookmakers except Marathonbet. Odds provided by all remaining bookmakers dropped within my inflection points with an exception of Marathonbet (and sometimes 1xbet is also slow to follow the market). They lower their odds just 0.2 or so during the last hour, while others move their odds down 0.5-0.6 or so. And if odds at Marathonbet are 4.3 and the rest of the bookmakers have 3.8-3.9. I would say Marathonbet is quite off line and what confuses me the most, these odds are available in their site to bet on, so it’s not Oddsportal fault. If my inflection points are between 3-4 should I care about Marahonbet odds or remaining bookmaker odds considering are the odds within my inflection points or not? Updating the tables each season is a major task. You also need reliable historical odds representative of a certain period in time in order to use the tables most effectively. We also upgrade the tables each season with improvements or extra features. We are therefore sorry that we cannot provide a user manual for people to upgrade the tables themselves. Besides, in terms of the the time it would take to perform such an exercise, it is probably cheaper for our customers to buy the newest versions. The updated Winter League tables will be available in late May, early June, when the 2016-17 seasons have ended. You said you use the highest closed odds. Its Ok, but my question is: Which bookmakers’ odds? Because on the page Oddsportal there are many soft and small bookmakers for example 1xbet, Marathonbet, Tempobet etc.. who give the highest odds on the market. Why? Because the are very slow and they can not follow quickly the oddsmoving. Also I would like to know, from which bookmakers odds do you choose when you make the HDAFU tables? Yes, we use Oddsportal odds but we are also aware of the technical glitches they have. Indeed, all sites using API’s to record odds at specific times have problems. Certain bookmakers on Oddsportal do not update properly. This can create a situation where a firm’s opening odds never update and end up appearing as their closing odds too. They then stick out like a sore thumb in comparison to the closing odds of others around them. Because of this, Oddsportal highest odds at close of the ante post market need to be checked for accuracy. When recording them we use over-round calculations as an indicator of anything that needs to be double-checked. Getting accurate odds representative of any one moment in time during the ante post market is the biggest challenge for anyone when compiling data for analysis. We have no choice but to use Oddsportal’s compulsory set of 20 bookmakers or so, added to which, are another 10 of the larger, more reliable firms. Our personal portfolio is therefore around 30 bookmakers. Many of the problems are caused by Oddsportal’s compulsory list. Problem bookmakers here include Tempobet, Marathonbet, Titanbet, Boylesports, William Hill, to name but a few. Contrary to your point about odds moving slowly, I would disagree as no bookmaker wishes to remain with the highest odds on any outcome for any great length of time. They need to keep their books balanced and will dip in and out of the market according to the weight of money they receive from the punters. If any one bookmaker were to offer best price some way ahead of its rivals, then it would see a lot of money placed on that outcome as punters shop for the highest price. Receiving a flood of money on one outcome leads to more difficulty balancing the other outcomes. Low margin bookmakers (e.g. Pinnacle, Marathonbet) rarely offer best price on the favourites – more usual practice is bigger prices on the more unlikely outcomes. It is always educational to watch a site like Pinnacle and see how often their prices move – sometimes several times a minute on the more popular games. Compare this with betting exchanges where prices also fluctuate from minute to minute. Of course, betting exchange prices are influenced and led by the bookmaker prices – if this was not the case, we would all be rich, successful and professional arbitrageurs!